Anyone who knows me, from family and friends to my professional makeup industry relationships, hears my constant mantra about maintaining a good skin care regimen with zealous sun protection. And for good reason. Without a well-cared for skin “canvas” makeup doesn’t have the best support to do its optimal duty of beauty enhancement and elevating best features forward. Instead, it often gets relegated as a means of disguise and concealment for hiding flaws or discolorations in the complexion due to daily neglect and sun overexposure. The environmental harm shows up in later years as permanent skin damage along with premature aging, some of which can’t really be reversed. It can also lead to more serious skin issues. No amount of cosmetics can successfully camouflage long-term carelessness as if it didn’t happen, as it will definitely leave its marks and be more difficult to manage under makeup. 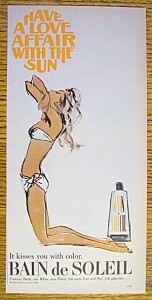 In my teen years my friend s and I idolized the look of the beautiful copper toned “Bain de Soliel” girl in the television and magazine ads during the 60’s. We did the sun worshipping “baby oil and mirror bake” poolside as if it were a religious gathering during the summer months. 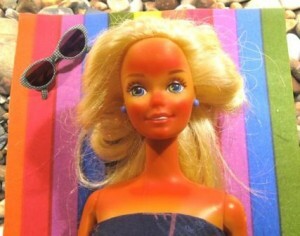 The dry heat in my home town of Phoenix, AZ, where daily summer temperatures regularly soared past 100 degrees, made it quick and easy to acquire the bronzed diva look. That was the era of Southwest style “fashion week” that lasted all summer long, with that burnished brown polish you worked hard to get to the envy of others. We’re talking head-turning tanned skin here, showing it off with little more than a bikini by day, and halter tops, shorts, and flashy looking sandals for a night out. Yes, we were devoted sunbathers, with little regard to the fact that we were essentially deep frying the DNA programming of our skin cells in a trade off for that very fleeting look of a youthful golden tanned goddess. There was relatively little media that was thinking, talking, or warning the public about the fact that unprotected sun worshipping, such as repeated burns and deep tanning, leads to everlasting skin damage. Instead, we were ignorantly encoding our future skin beauty and looks with an increased likelihood of premature aging and skin cancers. Photo aging from the sun leaves the skin with a leathery and heavier lined look, along with a dull and lifeless texture, as often seen in women now who grew up as sun lovers in that era. Thankfully, our culture has become more keenly aware of the need for sun protection, as skin cancers due to sun exposure has risen sharply over the decades since the 60’s. Much research in dermatology has been devoted to the cause and effects of skin damage with a particular emphasis on the effects of the sun. The result is the development of highly effective sun care protection protocols along with clinically proven anti-aging skin care products, and the widely held view that sun protection is a year around vigil, not just in summer. Fortunately, I wised up sooner than later from my sun goddess pursuits and after very bad sunburn that put me in the hospital from a day of open sailing all day on a lake. The reflection of the sun off the water to my bikini clad, baby oil doused skin might as well have been classified as a nuclear conducted radiation burn! To this day, many decades later, I have permanent sunburn/skin damage marks from that disaster. I am continually fending off other suspicious looking growths with more periodic visits to my dermatologist, who happens to be one of the top clinical research docs on the East Coast. I have learned a lot from her on these visits, and because she is very heavily into anti-aging studies, she has some strongly held opinions as to what really work as far as topical agents for anti-aging skin care regimens. She also believes effective sun protection is a multi level approach, and a key factor in the long term success of topical anti-aging regimens. So, for now, get your sunscreen game on (minimum 15 SPF) when outdoors, and get the heck out of the indoor tanning beds for good! Next month in Part 2 of this series I will share with you the do’s and don’ts that should be a part of your healthy summer skin care practices. As a licensed esthetician, SPF 30 is the minimum recommendation for sunscreen protection. Lots of great facial moisturizers on the market with SPF 30 to meet every skin type too! Tanning is visible cell damage. And tanning beds are the worst! Thanks for the great article.